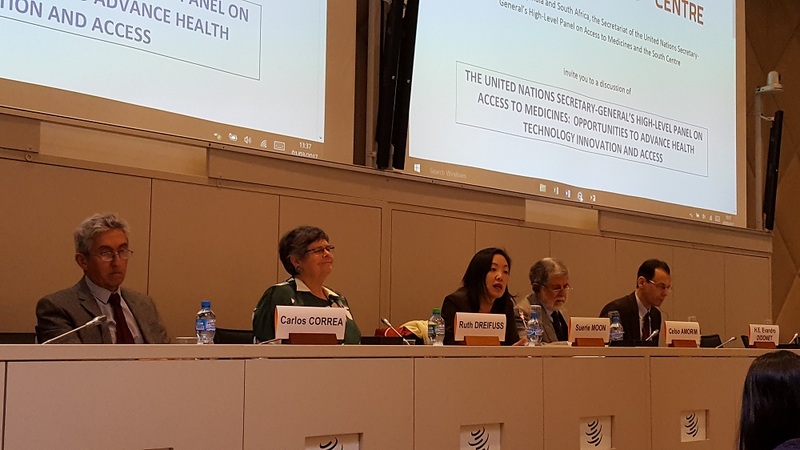 An event held at the World Trade Organization last week walked through key recommendations of the United Nations Secretary-General’s High-Level Panel on Access to Medicines, including strategies for moving some of them forward. On the margins of the WTO Council for Trade-Related Aspects of Intellectual Property Rights (TRIPS) meeting last week, several developing countries, along with the secretariat of the UN High-Level Panel and the South Centre, organised a side event to prompt discussions about the report of the panel, which includes recommendations to WTO members. Bangladesh, Brazil, India, and South Africa co-organised the side event, held on 1 March, which featured one of the two co-chairs of the High-Level Panel, the chairman of the UNITAID Board, the ambassador of Bangladesh, ambassador of Brazil, and a well-known academic on the question of access to medicines. The speakers underlined and presented some of the recommendations they found most relevant to the WTO, in particular the importance of transparency in prices, the use of international trade flexibilities, safeguards in free-trade agreements, and compulsory licences. Bangladesh embraced the report’s recommendations but said least-developed countries need help implementing them. The High-Level Panel report [pdf] was on the TRIPS Council agenda last week and is expected to be the further discussed in future sessions (IPW, WTO/TRIPS, 3 March 2017). It will also be discussed on 8 March at the Human Rights Council in Geneva. Ruth Dreifuss, former president of the Swiss Confederation and co-chair of the High-Level Panel, remarked that in the last 10 years, the problem of access of medicines became a global issue, in particular for non-transmissible diseases for which the cost of new medicines is the highest. She said this extends to diagnostics and medical devices, which usually do not receive the same attention as medicines, but for which prices also are highly influenced by intellectual property protection. For example, she said, some drugs are out of patent but remain highly priced because they are delivered through medical devices. Dreifuss put special emphasis on the last chapter of the High-Level Panel report, which gives recommendations on governance, accountability, and transparency. It is important for the fairness of price negotiations between countries and the pharmaceutical industry, she said, and also to make sure that what is paid by the public at the beginning of the process will not be paid again at the end, at the time of procurement. 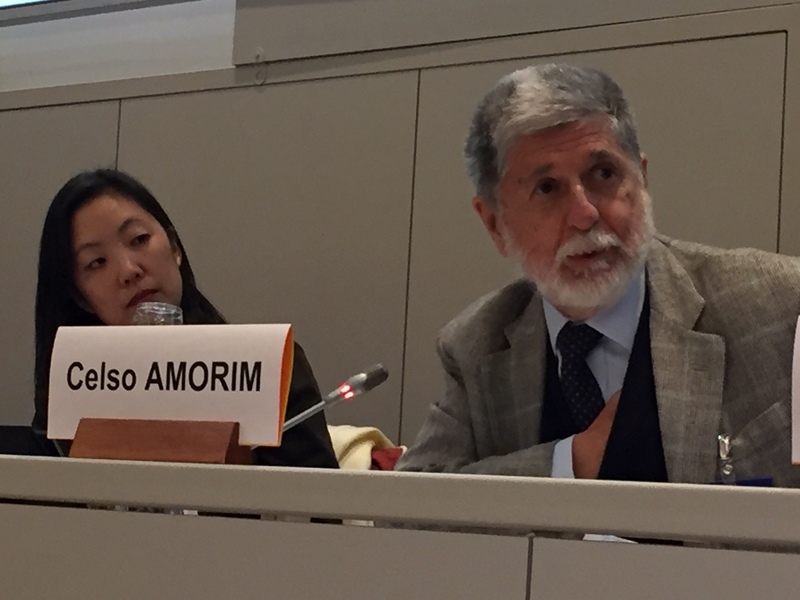 Celso Amorim, chair of the UNITAID Board, former Minister of Foreign Affairs of Brazil, and member of the High-Level Panel, said the report of the panel was agreed by consensus and presented to the UN Secretary General, who welcomed it. He chose to underline the importance of the report’s recommendations on the TRIPS flexibilities, and so-called “TRIPS-plus” provisions. The TRIPS agreement is considered as providing a minimum standard of protection to be granted by countries to intellectual property. TRIPS-plus provisions, typically in bilateral and plurilateral free trade agreements, go beyond the requirements of the 1994 TRIPS agreement. He said Brazil accepted TRIPS with “great reluctance” because it imposed many limitations on the industrialisation of developing countries, in particular in the field of pharmaceuticals. However, HIV/AIDS changed the situation, he said, as the need for countries to find medicines for their populations pushed them to use what he labelled as “ambiguities” in the TRIPS agreement, which were later referred to as flexibilities. Brazil was brought to court by United States companies over Brazil’s patent law, and “at the end they had to give up,” he said. He mentioned the newly adopted amendment to TRIPS allowing WTO members with insufficient or no manufacturing capacities in the pharmaceutical sector to import drugs produced under compulsory licence by drug makers in third countries, known as the “Paragraph 6” mechanism (in reference to Paragraph 6 of the Doha Declaration on TRIPS and Public Health). The mechanism has been used all but once, he said, but not for technical reasons, the main problem is political, he said, as an “incredible political pressure” is put on countries considering using it. The WTO has been impotent to solve the problem, he said. 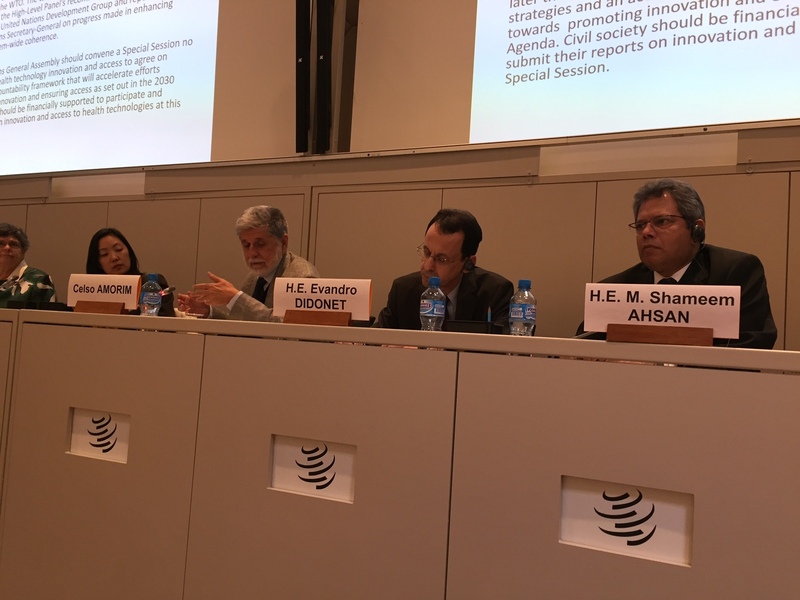 Brazilian Ambassador to the WTO Evandro Didonet said Brazil continues to believe that IP, public health, and access to medicines are not mutually exclusive. The TRIPS agreement states that IP rights should be implemented in a manner conducive to social welfare and TRIPS flexibilities became policy spaces. The TRIPS flexibilities serve the purpose of bringing together IP and public health concerns, he said. He focused on two recommendations, one of which was the adoption of the new TRIPS amendment, which happened in January, after the report was released in September 2016. The amendment provides a more solid legal framework for countries, he said. “We now have homework to do,” Didonet said, to insure the effective implementation of the amendment. He said Brazil suggested that WTO provide technical assistance to countries so they can craft legal measures to incorporate the amendment in their domestic legal systems, and WTO should also promote capacity-building and awareness raising. The second recommendation of the report underlined by Didonet was that governments engaged in bilateral and regional trade agreements should make sure that these agreements do not include provisions that interfere with their obligations to fulfil the right to health. He added that Brazil has drawn a “red line” in such free trade negotiations to prevent TRIPS-plus measures that would be detrimental to public health policies. “We do not have many red lines, but this is one of them,” he said. Bangladesh Ambassador M. Shameem Ahsan said humanity is at a crossroads. The right to life is the most fundamental right, he said, immediately preceding the right to health. In terms of accessing medicines, least-developed countries “are the hardest hit,” he said. In LDCs, both private and public sectors are “extremely weak to undertake any such collaboration and investment,” he added. To implement the report’s recommendation, LDCs, “will need active support and transfer of technology from the developed countries and their private enterprises,” he said. LDCs also support the recommendation of the panel that LDC governments should undertake public health impact assessments before they enter into such agreements, he said. Ahsan also highlighted the recommendation that public funders of research must require that knowledge generated from such research be made freely and widely available in peer-reviewed literature, and that universities and research institutions that receive public funding should adopt policies that promote biomedical research and knowledge that benefits the public health objectives over financial returns in patenting and licencing practices, such as non-exclusive licensing, participation in public sector pools, and donation of IP. Ahsan also supported the recommendation of the panel for a binding research and development convention that delinks the costs of R&D from the end prices and “we are happy to participate in any negotiation to establish a working group for preparing a Code of Principles for Biomedical R&D,” he said, calling for help from developed countries to incentivise and reward public R&D in LDCs. He said the most important factor impeding access to medicines in LDCs is the cost, in particular the cost of patented medicines, and he called for manufacturers and distributors to disclose the cost of R&D, production, marketing, and distribution of their products, as well as data for clinical trial, as suggested by the report. Prof. Carlos Correa, special advisor, trade and intellectual property at the South Centre and a member of the High-Level Panel’s Expert Advisory Group, chose to highlight patentability criteria. The report, he said, provides a strong recommendation in relation to the quality standards that should be applied to patent applications. It is very common for pharmaceutical companies to file for patents with no real innovation, or minor developments, he said, adding that if patentability criteria are weak, price competition is reduced, procurement and innovation are affected. The report calls for international organisations, such as the World Health Organization, WTO and World Intellectual Property Organization to support governments to apply public health-sensitive patentability criteria, and those organisations should strengthen the capacity of patent examiners at both national and regional levels to apply rigorous public health-sensitive standards of patentability taking into account public health needs. Correa’s other highlight was about compulsory licences. He said there is a need to dispel the myth that compulsory licences can only be used in case of health emergencies. It is an important tool to ensure public health needs are reached, to reduce prices and promote access to medicines, he said. A number of developed countries grant compulsory licences, he said, citing the recent German Federal Patent Court decision to grant a compulsory licence on the antiretroviral compound raltegravir to the US company Merck, for the German market, according to Business Law Magazine. Correa also underlined the importance of competition law in access to medicines. Competition law is not only there to protect competitors, he said, but also to protect consumers. "Main Recommendations Of UN High-Level Panel On Access To Medicines Presented At WTO" by Intellectual Property Watch is licensed under a Creative Commons Attribution-NonCommercial-ShareAlike 4.0 International License.